MARY PARSLEY was a Scottish convict woman who was tried and convicted at the Cumberland Quarter Sessions on 3 July 1838 for stealing a shawl and sentenced to seven years transportation. 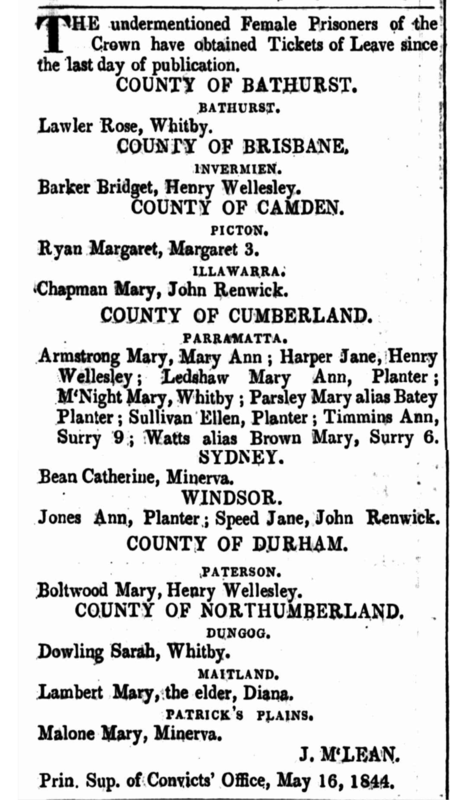 She arrived in the colony of New South Wales per Planter (2) (1839) and was based in Parramatta for at least part of her sentence. In February 1844, she was likely the woman incorrectly recorded as MARY PEISLEY; one of at least two servants working for the HOUISON family, i.e. the family of distinguished Parramatta architect JAMES HOUISON and ANN HOUISON (née ANN STARK). Like MARY, JAMES HOUISON was also Scottish and Presbyterian. 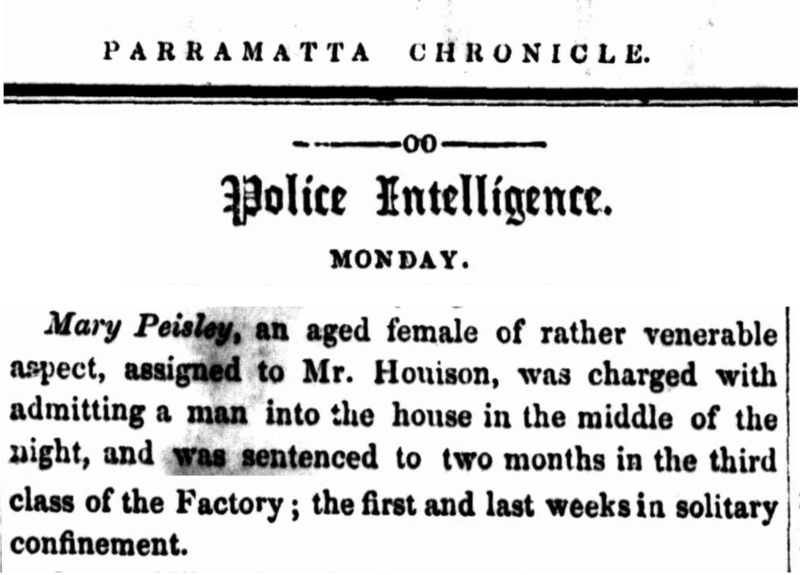 When Mrs. HOUISON discovered an unknown man sneaking into the HOUISON family home to have a Valentine’s Day rendezvous with MARY on 14 February 1844, however, MARY found herself hauled before the police and sentenced to two months in the third class of the Parramatta Female Factory with the first and last week spent in solitary confinement. Nevertheless, MARY PARSLEY received a ticket of leave within the district of Parramatta in May 1844. In September that year, her ticket was applied to Sydney “for so long as she remains in the service of Mrs. MARTIN of Sussex Street.” In December, her ticket of leave for Sydney was updated following her reassignment to a man living on Castlereagh Street, Sydney. On 17 May 1845, however, her ticket of leave was cancelled when she was “found living in a state of adultery per the Government Minute on a letter from the Hyde Park Bench.” Nevertheless, MARY received her Certificate of Freedom on 10 October 1845. What became of MARY PARSLEY after this date is not yet known. Female Factory Online (https://femalefactoryonline.org/, 2019), Law Report of MARY PEISLEY (p18440222). “COUNTRY NEWS. PARRAMATTA,” The Australian (Sydney, NSW : 1824 – 1848), Thursday 22 February 1844, p. 3. “No title,” New South Wales Government Gazette (Sydney, NSW : 1832 – 1900), Tuesday 21 May 1844, [Issue No. 47], p. 711. “SHIPPING. 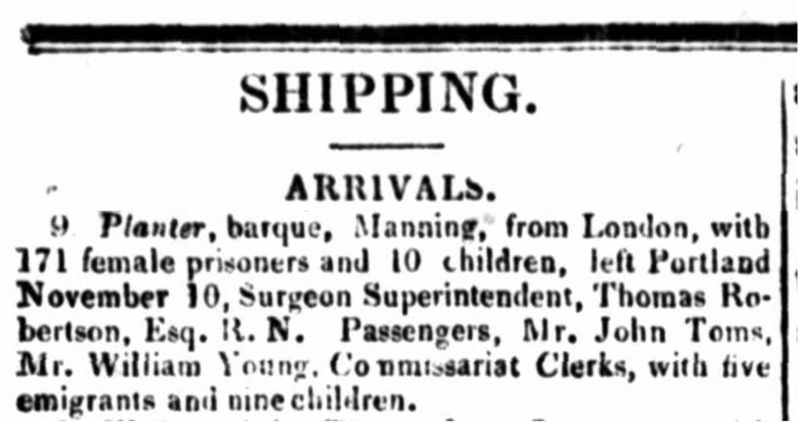 Arrivals,” The Sydney Standard and Colonial Advocate (NSW : 1839), Monday 11 March 1839, p. 2. 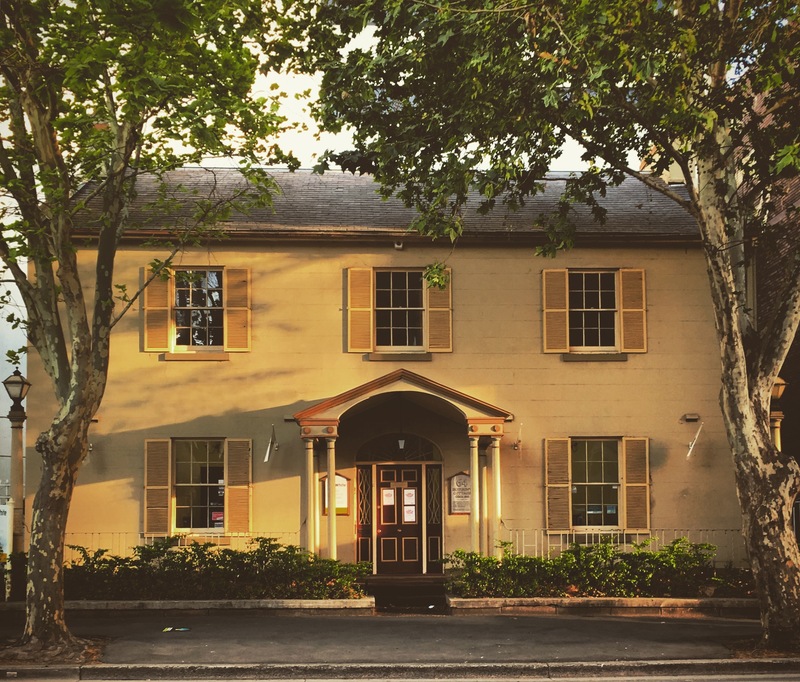 Kia Ora, Houison’s Cottage at 64 Macquarie St, Parramatta. CC BY-NC-SA 4.0. Photo: Michaela Ann Cameron (2017). New South Wales Government, Annotated printed indents (i.e., office copies), NRS: 12189; Item: [X642]; Microfiche: 739, (State Records Authority of New South Wales, Kingswood, New South Wales, Australia). New South Wales Government, Butts of Certificates of Freedom, NRS: 12210; Item: [4/4401]; Reel: 1021, (State Records Authority of New South Wales, Kingswood, New South Wales).